20-year-old jockey Donnacha hasn’t ruled out following in the footsteps of his father and brother by becoming a trainer. Donnacha with his brother Joseph (left) and Speak In Colours at the Curragh. 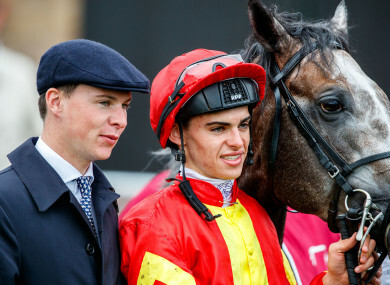 THE CHALLENGE DONNACHA O’Brien tackles daily to keep his weight down may shame the very many who have tried and failed with modest dieting aspirations. For all the most noble of intentions and wishes, life tends to get the better of you. If you are riding some of the best horses in the world and need to live every day as a Lough Derg retreat, it is a bit easier. “At this stage I am very hopeful of doing nine stone again this season,” he tells me nonchalantly. Donnacha, who turns 21 in July, stands at 5’11″. Not quite Christian Bale in The Machinist — but pretty emaciated. To be able to “do nine stone” on a horse, you essentially need to weigh no more than 8st 12lbs (to allow for saddle weight). Last year, he told Off The Ball’s ‘Friday Night Racing’ that he was managing his weight. That was around 3.30pm on a Friday. He had not eaten since the Thursday morning, when he barely ate at all. It seems the obvious way to start our interview, given the rumours that he will embark on a training career sooner or later and his father frequently saying his youngest will ride only for as long as he can. It only took you one question,” he laughs, “to ask about the weight! “It is never going to be easy but I think I should be able to do nine stone again this year again. As I’ve said plenty of times, all jockeys have their minimum weight and struggle to get it. If I am not able to do it I won’t but at the minute that is the plan. “I am not a big man for diets,” he adds with beautiful and unwitting contradiction. “A diet is fine if you want to lose fat but I have very little fat on my body. If I am doing light I cut out all food for a day or two and get to my minimum body weight. Since his first interview, Joseph O’Brien has come across as a near-clone of father Aidan – polite, self-effacing, never prone to hyperbole. The boys’ sisters Ana and Sarah are similar in that regard. If the nipper in the clan tends to be the rebel, that is Donnacha. He speaks with patent intelligence and a refreshing hint of the cavalier. “I was pretty much useless at everything at school – but for horses I’d probably be drawing the dole,” – the one lie he imparts in our interview. Did he actually have an interest in law? Donnacha is privileged and knows it. He recalled Peter Crouch’s superb retort (I’d would be a virgin if I wasn’t a professional footballer) when responding to a query about his best attribute by saying he was “Aidan O’Brien’s son” after a race last year. He also admits to technical deficiencies in his riding but he was champion jockey last season, rode three Classic winners (none of them favourite, one of them 14/1) and is simply a very good rider. O’Brien won the title last season despite riding for no other surname. He took zero rides in Ireland outside of those trained by his dad or brother, yet he remarkably spends no time riding out at Joseph’s. “We all get on very well. People ask this the whole time, wanting to find out that secretly we hate each other. Unfortunately we get on very well and bounce things off each other the whole time. “I think Joseph doesn’t want to see me any more than he does! He has a great team up there. It’s different for him, in that we have specific work mornings in Ballydoyle whereas his jockeys ride their specific horses for all pieces of work. It would be pointless me being there even once a week. “The gallops are different. Joseph has one gallop; he gradually increases his work through the week. “We’ve a different system at Ballydoyle, where they do strong work twice a week, with jockeys riding them in the strong work. Dad maintains that Joseph has one of the best gallops in the world and Joseph has adapted and changed little things. Remarkably, Aidan O’Brien has no horse at single figures in the betting for any Classic in 2019 – but there is no getting away from how exciting the unbeaten Ten Sovereigns is. A son of No Nay Never (get it? ), his regular rider does not seem convinced he is a Guineas horse, instead focussing on his raw pace and power. The Flat season is but a month away. The spring is here. “I rode him the other day and so far so good. Nothing too exciting to report. He looks great; he has gotten strong. What are his interests outside of racing? “I’m big into all type of sports, though funnily I never got into GAA, even though I probably should. I watch football, boxing, UFC, golf, things like that. Imagine the heavyweight fights if Aidan, Joseph and Donnacha all have a fancied runner in a Curragh maiden. I think one or two other trainers might combust at the thought,” he laughs. The way the youngest talks about horses, he seems a certainty to go down that route. We discuss everything from stride analysis – “not something I am especially gone on as a bit of data” – to sectional timing – “basically a jockeys’ job – I am a big believer in that. It is using your horse as efficiently as you possibly can”. So he will become a trainer, right? Would he deal with the duress of dealing with owners, underperforming horses and other disappointments? His brother’s Lovee Dovee looks to have a massive chance in Dundalk’s 5.00 this evening, while a double with Denis Hogan’s Mulzamm (6.30) is strongly advised. However, Donnacha O’Brien can put the feet up this evening, as he skips the all-weather combat. His football team is Manchester United and when I ask him should Ole Gunnar Solskjaer get the manager’s job long-term, his reaction is revealing. He might have been Aidan O’Brien talking about the horses he trains. Or Donnacha O’Brien doing the same. Email “Johnny Ward: Aidan O'Brien's youngest son concentrating on riding while he can keep the weight down”. Feedback on “Johnny Ward: Aidan O'Brien's youngest son concentrating on riding while he can keep the weight down”.